Some local humanitarian organizations and grassroots initiatives in Macedonia are successfully using social media to encourage in-kind donations aimed at the country's poorest citizens. The organization “Food for All – BHM” advocates for the creation of food banks  aimed directly at helping vulnerable people and families in Macedonia. The NGO recently posted a set of data  [mk] on their website regarding those living below the poverty line in Macedonia, which according to official statistics, is 30 percent of the Macedonian population. Analyzed by profiles, most vulnerable groups include large households, considering the fact that 47% of poor people live in families consisting of five or more members. Poverty rate among the unemployed is 41.8%, and 44.8% of the poor are unemployed. Education of the head of the household also affects poverty level. 54.7% of poor people live in families where the head has no education at all or has only finished primary education. Most of these families rely on a single parent (mother) or old and feeble persons. This data calculates that over 600,000 citizens of the Republic of Macedonia live in poverty, and that over 60,000 people fall into the category of malnourished, with children making up over 50% of them. While an estimated 60 percent of Macedonian citizens are online, the development of e-commerce is lagging in comparison to the rest of Europe, and providing financial donations through the Internet is not very common. But grassroots humanitarian initiatives primarily use social media to raise awareness of their campaigns to give basic provisions such as food and clothes to people in need. Prominent examples include the initiative “Have a heart” (#имајсрце  in Macedonian) to help the children in the Goce Delchev shelter in the village of Ljubanci  [mk] in 2012, or blood donation campaigns  in 2013 and 2014. Sladjana V. lives with two young children of 3 and 1.5 years. She is unemployed and is temporarily sheltered in the monastery St. Ilija above the village of Banjani near Skopje. To get to Skopje for medical exams or other needs, she and her kids have to walk 4 kilometers to the bus station in Banjani. She needs food, cleaning supplies and personal hygiene supplies. Her biggest problem is unemployment and a lack of a permanent residence. Besides our association, she receives help from the residents of the village, the non-government organization Children's Embassy Megjashi , the local municipality, and other citizens. Please be generous and help Sladjana with your donations. After donation drives, they also provide accountability to the donors by documenting the delivery of aid, displaying photographic evidence that the items indeed arrived at their intended destination in a follow-up report  [mk]. They also send these links to individual donors, when possible. Donation delivery. Photo by A View on the Truth, from their project Real Acts of Kindness. Used with permission. For single mothers in the Butel and Chair municipalities in Skopje, they first visited them and confirmed the need for children’s clothing and shoes, food and hygiene products. They issued a call via Facebook  [mk] and Twitter for donations to be gathered at an accessible location in the city center, where they also provided a round of weekly food donations to the homeless  [mk], accompanied by hot tea or soup. Photo  [mk, photo] galleries  [mk, photo] captured the delivery of donated items. These visits also included playtime between children and their less fortunate peers, teaching them to share some of their belongings or prepare gifts. Such donations drives also include aid to single fathers  [mk] and donating baby carriage  [mk] or home appliances . 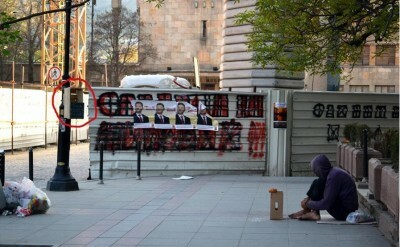 Share Food Facebook cover photo, showing their box on Macedonia street in Skopje. A construction site of a new government building displays presidential elections posters. Share Food is a small initiative which we hope could mean a lot for some people. We need your support to succeed. This initiative is based on the idea of sharing and on faith in human beings and their awareness of others. We hope that in time the residents of Skopje will get into the habit of passing by the boxes and leaving food more often, so the hungry can have a spot to pass by and eat something to lessen their hunger.